Afghanistan has for long been called the Crossroads of Islam for its early Arab conquest, trading hubs, and continuous conflicts between Muslim empires. These Afghan men grow their beards traditionally long, wear their customary robes, and are as tough as the harsh world that bred them. 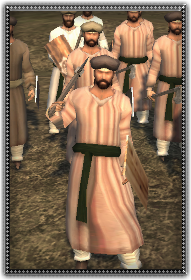 Having been under the control of the Ghaznis, Ghorids, and many other empires prior, they accept the fact that they must fight for the current lord of the land. Armed with a mere axe and small wicker shield they fight with vigor to compensate.